In view of the upcoming Festival of the Nine Emperor Gods which will be from 15th to 23rd October, 2012, we, Persatuan Penganut-Penganut KEW ONG TAI TAY, would like to take this opportunity to invite sponsorships of giant dragon joss sticks measuring 23feet 8in in height each for offering to the Nine Emperor Gods. If you wish to sponsor, kindly email us at the following address before 8th October, 2012 for further information. 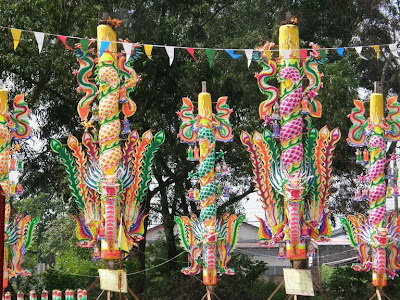 We will then place our orders with the joss stick manufacturer as these are custom made giant dragon joss sticks. Sponsorship could be from individuals, companies, organizations, or groups, i.e. shared among family members, relatives and friends. We thank you in advance for your generous sponsorship.